The Barnegat Inlet, although dynamic and constantly changing, allows access to and from both Barnegat Bay and the Atlantic Ocean north of Long Beach in New Jersey. Barnegat Inlet is 70 miles north of Cape May, 50 miles south of Sandy Hook, and 55 miles east of Philadelphia. 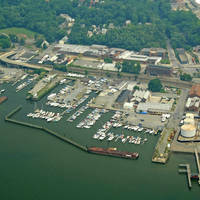 Inside the inlet to port on entry you will find a wide array of marine facilities at your disposal. There are eight facilities located here, and there are a few that will accept transient guests. 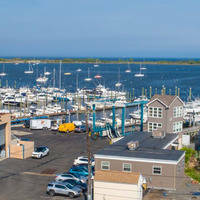 Repair facilities are available also with three marinas having lifts for haul-outs. You will not find Barnegat Inlets buoys charted on any chart version you pick up. Because the channel changes so rapidly here, the Coast Guard is forced to frequently survey the inlet and reposition buoys accordingly. Approaching from the Atlantic, first pick up red and white Morse (A) buoy BI, which is about 1.5 miles from the inlet jetties. Once you have picked up the red and white Morse (A) buoy, set a course to the northwest to pick up quick flashing green 7 and quick flashing red 8 at the south and north inlet jetties, respectively. Once you are in the inlet, you will see the now abandoned Barnegat Lighthouse. To reach the marina facilities, you will turn to the south after the lighthouse. A seven- to 11-foot deep channel leads into a basin. No reviews yet! 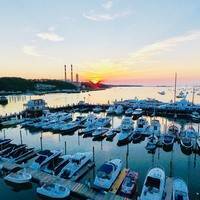 Be the first to write a review of Barnegat Inlet.